LED Video Wall – Making its first appearance! Staying at the forefront of the industry and adapting to new or different exhibition methods, are a set of principles that we take very seriously here at MODEX. We are always on the lookout for new ways of boosting our products and professional service and making sure that the client – no matter how big or small – gets a service that promotes their brand to the best it can be.Staying at the forefront of the industry and adapting to new or different exhibition methods, are a set of principles that we take very seriously here at MODEX. We are always on the lookout for new ways of boosting our products and professional service and making sure that the client – no matter how big or small – gets a service that promotes their brand to the best it can be. A few months ago, we increased our service list with the introduction of BeMatrix’s LED video wall system that neatly sits within our modular system. 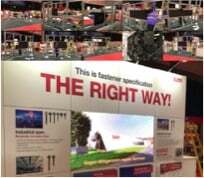 The video wall can help make a stand shine that little bit brighter and catch any passer’s eye, making it a greatly valuable asset to any stand’s professional and creative exhibiting arsenal. The system comes as multiple LED panels fitted together and this also allows us to use the system in a variety of ways. In landscape, portrait or even in a mixed set-up combined with standard graphic panels, the video wall can be tailored to meet most requirements and help to make your stand look that much better and engaging. 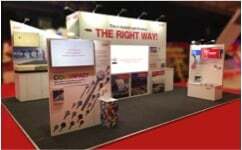 Creating a stand that helps to promote your business and brand in an informative and engaging manner is the key to finding success at any type of show. You want to be able to create a space that is welcoming and represents your company at its best for all your clients – current or new. With its high-resolution panels and seamless integration, the video wall fits perfectly into any stand. Combined with the modular system we use, it helps to bring fluidity and professionalism amongst the whole stand’s graphic design and ensure your brand is shown off the right way. This month, the video wall made its way out across Europe to two different stands. Both EJOT and Hochiki Europe decided to use the video wall to help boost their stands’ engaging and welcoming environment and try to inform their clients and customers in a different way. The build process is simple and quick, and we take every precaution to ensure that there will be no problems with whatever type of media you would like to play. No matter what resolution or type of content it is you want to display, we will work with you in the run-up to the show to make sure the best solution is met for your needs. Whether that is the standard widescreen landscape view, or even a jumbled mixture of video and graphic panels, the whole system can work and adapt to different needs and requirements. For EJOT, we delivered and installed an 8m x 6m stand with raised flooring, modular walling structure, lighting, AV and counters as well the LED video wall. They needed a stand that had space to create a warm and welcoming environment, whilst simultaneously having multiple structures to show off their product, brand and company. The video wall fits seamlessly into the centre of the stand and acts as an informative hub, ensuring that any passer-by is immediately both intrigued and informed about the business. 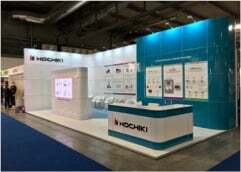 Hochiki Europe’s stand was different, but similarly effective. At slightly a different shape the stand measured in at 10m x 4.5m. With its glossy panels, 3D lettering and separate video wall structure, the stand works really well as a space to interact with customers and for the company to show off their products and services. If you’re exhibiting at any event, it is important to pay great attention to the space you have and the space around you. This is something we take great care with when designing and installing our stands. Each stand is designed to get the best out of your event and therefore every step will be taken to make sure of this. 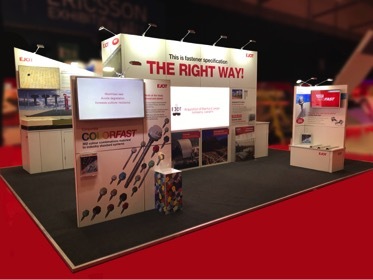 If your stand is above 36m2 then we can include the video wall at no additional cost to the package. For a product that makes your business stand out in a unique and professional manner, the LED video wall really does give you that extra arsenal to making your next event the most successful yet. To catch up on all the latest news follow our Twitter feed.